General objective of this report is to analysis Foreign Exchange Business (L/C) of the National Credit and Commerce Bank Limited. Other objectives are to understand the Banking business in Bangladesh and how Banking transactions Take place. Report also focus on to know the background of the bank and analysis the Financial and Accounting techniques of NCCBL. Finally draw SWOT analysis and to appraise the total achievements and success of NCCBL. Now a days Industries as well as the Non Resident Bangladeshi and persons working outside are the real assets of the remittance business of the country. To motivate and also to ensure increased remittance flow, NCC Bank has made a number of arrangements with various exchange companies. NCC Bank considering taking steps so that the beneficiaries here in Bangladesh can receive the money at their door steps. The total amount received by Bank in 2006 was more than US $ 52.56 million. Most large remittance comes from foreign exchange business including Import and Export. Bank largely depends in its Foreign Exchange Business to ensure profitability. To look after the Business and also to ensure prompt service to the Import and Export, officers having exposure and expertise in Foreign Exchange Business have been posted both at Head Office & Authorized Dealer Branches. During 2006, the Bank handled Export and Import business to the tune of TK. 8557.03 million and TK. 17646.84 million respectively. Bank’s wide network of correspondence plays vital role in facilitating its international trading. At present, total number of correspondents is 335. With a view to facilitating homebound remittance, the Bank made arrangements with a number of exchange companies during the year. This arrangement brought significant development in remittance business. NCC Bank is going to expand this network in near future. Corporate Governance establishes specific responsibility to ensure accountability. With a view to ensuring accountability and fairness in functions of the company and also to comply with the requirements of regulatory agencies, care has been taken to improve Corporate Governance. Due to this practice the remittance department of NCC Bank has been growing to provide a good participation in the profitability of the Bank. To understand the Banking business in Bangladesh. How Banking transactions Take place. To know the background of the NCCBL. To know Foreign Exchange Business (L/C) of the National Credit and Commerce Bank Limited. To understand the Financial and Accounting techniques of NCCBL. To have the idea about the communication between the branch office and Head office. To better understand about the foreign exchange activities. To appraise the total achievements and success of NCCBL. National Credit and Commerce Bank limited came to reality through the “National Credit Limited”. Prior to conversion into a scheduled commercial bank, National Credit Limited (NCL) was incorporated as an investment company on 18th November 1985. It made its journey on 25th November 1985 at its registered office and first branch at 7-8 Motijheel Commercial Area, Dhaka-1000 with initial authorized capital of Tk. 30 crores. It was mostly involved in collecting suitable resources and making profitable investments. But within a very short period of time this investment company turned into a scheduled commercial bank. It was turned into a bank because it faced many restrictions in both collection and disbursement of funds while it was operating as an investment company. While this turnover was going on all types of transactions were closed for about fourteen months from April 22nd, 1992. After that, with the permission from the government and Bangladesh Bank, NCL was converted in a full fledged commercial bank and started its banking operation on 17th May 1993, in the name of National Credit and Commerce Bank Limited. It has been registered under the company act-1913, as a private commercial bank with paid up capital of Tk. 39 crores to serve the nation along with 16 branches. However, NCCBL runs as per company rule, free from government intervention. Year 1994 & 1995 were the full operation year of the bank. During this period gave emphasis on considering the affairs of the institution as well as expansion of business work. During last 13 years if its operation NCCBL has acquired commendable reputation by providing sincere personalized service to its customers through a technology based environment. To provide excellent customer service to its clients, so that they choose NCCBL first for their banking. Ensure high return on investment and services with different service products. Making profitable investment and grow in annual profit margin. To remain as the market leader through diversification of business and automation of banking operations. Maximize the profit within the shortest possible time. Try the best level to satisfy customers. Establish NCCBL as the best performing bank in the country. Ensuring smooth operation in all the departments. Maximize profit in every branch of the bank. It is the order of the day to deliver prompt services to the customers taking assistance of modern facilities. NCC bank has recognized this and taken all possible steps to introduce technology-based Banking service to the customers. In line with this, Bank’s IT Division has already brought 14 Branches under On-Line Banking and working hard to bring other Branches under its scope at the soonest. NCC’s VISA brand Credit Card being sold in the market defying fierce competition in the sector. NCC bank is operating its Foreign Exchange Business with the help of SWIFT. 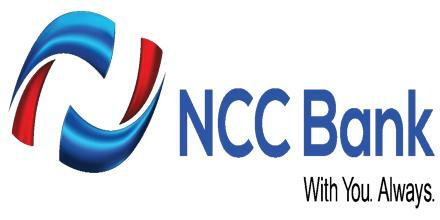 NCC bank has given proper stress on foreign exchange remittance business. The garments industries as well as the Non Resident Bangladeshis and persons working outside are real assets of the remittance business of the country. To motivate and also to ensure increased remittance flow, bank has made a number of arrangements with various exchange companies. NCC Bank’ Agro-project implemented through Doel Agro products in northern part of the country still remains a profitable venture. This project helped the Bank exploring new avenue of lending as well as provided scope to these remote centers of economic activities. The Bank is considering awarding stipend to talented students of the project Area to help them in their education. Recently, The Bank has also distributed educational materials at the remote area of Dahagram and Angorpota on the occasion of Independence Day 2007. The Bank also extended credit facility to fisheries industry as part of its agrifinancing which received satisfactory response. NCCBL recognizes that Banks are not mere profit earning institutions rather they have great responsibility towards the society in which they are operating. In this respect, NCCBL is happy that its presence level. A number of seminars have been arranged under its auspices on the topics of economic & social aspects which provided a way of looking at the picture from different perspective. One of the major achievements of NCC Bank Foundation. It has plans to serve the society through the Foundation. NCCBL has recently accorded a grand reception to Language Veteran Mr. Abdul Matin at Jatiya Jadughar Auditorium. Books of different tastes have also been distributed to educational institutions situated at various remote areas of the country. Prior to that the Bank co-sponsored the reception accorded to Professor Dr. Muhammad Yunis on his receiving Nobel Prize for Peace 2006. Also NCCBL has sponsored and participated as cosponsor in various events like National Volley-Ball Tournament-2006, NCC Bank Golf Tournament-2007, Dhaka University Convocation ceremony & publishing of souvenirs in connection with ICC World Cup Cricket-2007. Moreover, NCCBL is considering to award scholarship to the talented but distressed students and grand assistance to the off-springs of its supportive staff. Constructive steps have been taken to buildup a progressive and positive image of the Bank. With this end in view, advertisements in both print and electronic media are being inserted on regular basis; other steps were also taken. In order to establish specific responsibility and ensure accountability, befitting steps have been taken by the Management with the guidance of the Board. Various operational aspects are discussed regularly in Branch managers and Deputy Managers’ Conference’s to formulate proper line of action. Holding of such conferences provide scope for consolidating management and streamlining administration of Branches. Besides, with a view to easing decision making process, experienced and expert officers from other Banks are being appointed through proper evaluation. Further, to ensure qualified manpower, probationary officers are also being recruited every year on regular basis through competitive examinations and with these meritorious persons; NCCBL hopes to have a bunch of NCC cadre officers. As part of its goal of maximizing profit by rendering personalized services To the customers, making good advance improving quality of assets and above all recovering Bank’s money from defaulters, the Bank has continued its efforts during 2006 with fruitful results which reflects in the operational result as enclosed with this report. However, operational profit stood at Tk. 1,267.57 million during 2006 against Tk. 1018.34 million of 2005 recording an increase of 41.33% over the period. The Authorized Capital of the Bank remained at Tk.2,500.00 million during the year as before but paid-up Capital raised to Tk.1,201.80 million against Tk.975.04 million against 2005. The Reserve Fund increased to Tk.1,215.58 million during the year by registering 37.37% increase over last years’ Tk.884.90 million. Bank’s deposit as on 31st December 2006 stood at Tk. 28,147.34 million with an increase of 31.05% over last year’s figure of Tk. 21,478.22 million. The chart below shows the growth of deposit for last 05 years. Under its declared credit policy the Bank operates through a number of conventional and various credit schemes including Small Business Loan, Housing Loan, and Festival Loan which help playing effectively in the market and insures steady earnings for the Bank. Bank’s leasing Unit and Syndicated Loans have also contributed to the income during the year as before. Its Agri-Credit Scheme sustained its viability by contributing to the profitability. During the year total Advance stood at Tk.24,678.36 million. Advance Deposit ratio was 0.88:1 in 2006. Investments figure of the Bank as 31st December, 2006 stood at Tk.3,552.08 million as against Tk. 3,010.45 million of the previous year-increase being 18% Considering the good rate of return, the Bank emphasized on making investment in Govt. Treasury Bill with a view to utilizing its liquid fund on temporary basis so that the same can be liquidate to meet urgent requirements. The Bank put due care to its Foreign Exchange Business which is one of the major sources of income and contributes notably towards its profitability. Under the purview of Bank’s Credit Policy and Government Policy, the Bank tries to cater the needs of Exporters and Importers of the country. With the expertise of the concerned officers at the Head office and Branches, Bankers business in this sector recorded notable development during 2006. The amount of export and import business handled by the Bank in 2006 was Tk. 8, 557.00 million & Tk17,646.80 million respectively as against Tk7,776.30 million & Tk.16,296.30 million in 2005. Total Assets of the Bank during 2006 was Tk.32,615.01 million as against Tk.26,114.13 million in 2005, rate of growth being 24.89%. Proper administration of credit portfolio and in case of need, appropriate recovery drive is of utmost importance for ensuring quality of assets. It is also Central Bank’s requirement under Core Risk Management. It’s Credit Administration(Risk Management) Department has shown satisfactory result in identifying potential bad loans for which it was possible to take corrective measures to safe guard interest of the Bank. The rate of classified loans during the year was 4.95% slightly higher than that of previous year’s figure of 4.82%. Through effective Fund Management, the Bank could earn Tk.237.79 million during the year through dealing room operation. The Brokerage3 House of the Bank could sustain its pace during the year under reference. Its success inspired the Bank to open a new station at Uttra R/A during 2006. The Bank has also plan to open few more stations at Banani, Dhanmondi in Dhaka and Agrabad in Chittagong in 2007. The operation profit of the Bank during 2006 was Tk.1,267.57 million as against Tk.1,018.34 million in 2005, rate of growth being 24.47%. Return on Assets (ROA) was 1.63%. The Board of Directors has been pleased to recommend 22.50% Dividend (10% Cash, 12.50% Bonus) for its valued shareholders for the year 2006. Foreign Exchange is a process which is converted one national currency into another and transferred money from one country to other countries. (ii) Any instrument payable, at the option of the drawee or holder thereof or any other party thereto. Either in Indian currency or in foreign currency or partly in one and partly in the other. Thus, foreign exchange includes foreign currency; balances kept abroad and instruments payable in foreign currency. xviii) Rules and Regulation used in foreign trade. possibility of obtaining money immediately through a descant transaction. In certain circumstances, how ever, the banks payment undertaking can be used as collateral for an advance, though such as advance will normally only be available form the issuing or confirming bank. A discountable bill offers wider scope. The purpose of an acceptance is to give the importer time to make payment. If he sells the goods before payments fall due, he can use the proceeds to meet the bill of Exchange in this way, he does not have to borrow money to finance the transaction. (vi) Negotiation credit: Negotiation means the purchase and sale of bill of exchange or other marketable instruments. A negotiation credit is a commercial letter of credit opened by the issuing bank in the currency of its own country and addressed directly to the beneficiary. The letter is usually delivered to the addressee by a correspondent bank. This credit is sometimes also as Hand on credit. (vii) Transferable credit: Transferable credit is particularly well adapted to the requirements of international trade. A trader who receives payment from a buyer in the form of a transferable documentary credit can use that credit to pay his own supplier. This enables him to carry out the transaction with only a limited and lay of his own funds. The buyer supplies for an irrecoverable credit issued in the traders favor. The issuing bank must expressly designate the credit as transferable. As soon as the trader receives the confirmation of credit he can request the bank to transfer the credit to his supplier. The bank is under no obligation to affect the transfer except in so far as it has expressly consented to do so. A letter of credit is issued by a bank at the request of an importer in favor of an exporter from whom he has contracted to purchases some commodity or commodities. The importer, the exporter and the issuing bank are parties to the letter of credit. There are however, one or more than one banks that are involved in various capacities and at various stages to play an important role in the total operation of the credit. iii) The Buyer and the Beneficiary. i) The opening Bank: The opening Bank is one that issues the letter of credit at the request of the buyer. By issuing a letter of credit it takes upon itself the liability to pay the bills drawn under the credit. If the drafts are negotiated by another bank, the opening Bank reimburses that Bank. As soon as the opening Bank, issuing a letter of credit (L/C), it express its undertaking to pay the bill or bills as and when they are drawn by the beneficiary under the credit. When the bills are presented to or when antic is received that bills have been presented to a paying or negotiating Banks its liability matures. ii) The Advising Bank: The letter of credit is often transmitted to the beneficiary through a bank in the latter’s country. The bank may be a branch or a correspondent of the opening bank. The credit is some times advised to this bank by cable and is then transmitted by it to the beneficiary on its own special form. On the other occasions, the letter is sent to the bank by mail or telex and forwarded by it to the exporter. The bank providing this service is known as the advising bank. The advising bank undertakes the responsibility of prompt advice of credit to the beneficiary and has to be careful in communicating all its details. iii) The Buyer and the Beneficiary: The importer at whose request a letter of credit is issued is known as the buyer. On the strength of the contract that he makes with the exporter for the purchase of some goods that the letter of credit is opened by the opening bank. The exporter in whose favor the credit is opened and to whom the letter of credit is addressed is known as the beneficiary. As the seller of goods he is entitled to receive payment which he does by drawing bills under the letter of credit (L/C). As soon as he has shipped the goods and has collected the required documents, he draws a set of papers and presents it with the documents to the opening bank or some other bank mentioned in the L/C. iv) The paying Bank: The paying bank only pays the drafts drawn under the credit but under takes no opening bank, by debating the latter’s accounts with it if there is such an account or by any other measured up, between the two bankers. As soon as the beneficiary has received payment for the draft, he is out of the picture and the rest of the operation concerns only the paying bank and the opening bank. v) The Negotiating bank: The negotiating bank has to be careful in scrutinize that the drafts and the documents attached there to be in conformity with the condition laid down in the L/C. Any discrepancy may result in refused on the part of the opening bank to honour the instruments is such an eventuality the negotiating bank has to look back to the beneficiary for refund of the amounts paid to him. vi) The Confirming Bank: Sometimes an exporter stipulates that a L/C issued in his favor be confirm by a bank in his own country. The opening this country to add its confirming to the credit the bank confirming the credit is known as the confirming bank and the credit is known as confirmed credit. iv) Trade terms: Such as F.O.B and CIF. v)Tenor of the Draft: This is normally dependent upon the requirements of the buyer. vi) Expiration date: Which is specified the latest date documents may be presented. In this manner or by including additionally a latest shipping date, the buyer may exercise control over the time of shipment. vii) Documents required: Which will normally include proforma invoice consular or customers invoice, insurance policies as certificates, if the source is to be effected by the beneficiary and original bills of lading. viii) General description of the merchandise:This briefly and in a general manner duly describes the merchandise covered by a letter of credit. The importer after receiving the proforma invoice from the exporter, by applying for the issue of a documentary credit, the importer request his bank to make a promise of payment to the supplier. Obviously, the bank will only agree to this request if it can rely on reimbursement by the applicant. As a rule accepted as the sole security for the credit particularly if they are not the short of commodity that can be traded on an organized market, such an arrangement would involve the bank in excessive risk outside its specialist field. The applicant must therefore have adequate funds in the bank account or a credit line sufficient to cover the required amount. (iv)Proforma invoice: It is the seller’s bill for the merchandise. It contains a description of goods, the price per unit at a particular location, total value of the goods, packing specifications, terms of sale, letter of credit, bill of lading number etc. There is no standard form far a commercial invoice. Each exporter designs his own commercial invoice form. The invoice is made out by the seller under his signature in the name of the buyer and must be submitted in a set of at least 3 copies. Its main purpose is to check whether the appropriate goods have been shipped and also that their unit price, total value, marking on the package etc. are consistent with those given in other documents. (v) Insurance policy: In the international trade insurance policy is a must to cover the risk of loss on consignments while they are on seas, roads, airways. The insurance is the responsibility of the buyers (consignee) under FAS, FOB and C&F contracts and of the seller (consignor) under CIF contract. The policy must be of the type as specified in the relative contract / credit. The policy would be for the value of CIF price plus 10 (ten) percent to cover the expenses and that is required to be obtained in the same currency as that of the credit and dated not later than the date of shipment with claims* being payable at the destination. It must be properly stamped. Like a bill lading it must be negotiable and be endorsed where it is payable to order. (vi) Certificate of origin: This is a certificate issued by a recognized authority in exporting country certifying the country of origin of the goods. It is usually by the Chambers of commerce. Some times, it is certified by local consul or Trade Representative of the importing country as per terms of the credit. (viii) Weightment and Measurement: Issued by recognized authority (like chambers of commerce and industry) in exporting country certifying correct weightment and measurement of the goods exported. i) Bill of exchange / Draft. iii) Airway bill / Railway receipt. viii) Weightment & measurement list etc. The negotiating bank after received the above documents / papers then this bank scrutiny the documents. The negotiating bank sends the original shipping documents to the L/C opening bank and keeping the second copy with the negotiating bank. If the shipping documents have any discrepancy, then the L/C opening bank informed to the negotiating bank within 7 days. Otherwise, the shipping documents have not discrepancy. If the importer have not adequate founds in the bank account then the bank payment to the foreign bank against the shipping documents. Today NCCBL is one of the leading and most successful Banking enterprises in the country. If pay a great role in the economy of the country. By export-import business the bank play a great role to the economy of Bangladesh. NCCBL is one of the greatest banks in export-import business. Foreign trade plays a vital role in the economic advancement process of a nation. So the trend of country’s foreign trade, i.e. import & export is a great concern to the government of a country. Fluctuation in the parameters of foreign trade immediately brings about some impact on the total economy. As such the nature, trend and the volume of foreign trade are required to keep peace with the national economic needs and objective. There may be some areas where emphasis is to be given while there may be others which deserve restrictions or discouragement. Moreover the items of import & export value and volume of the same, the corresponding time period, sources of fund far payment and receipt, all these factors are to be considered very carefully for making necessary adjustment to match with the national economic policies as well as achieve balanced economic growth through the Interpol icy and Interpol icy co-ordination. Before opening L/C in favor of the exporter the entitlement of the importer (total amount in taka he can import as per import policy) to be registered with Bangladesh Bank. For this purpose the importer is to apply through L/C. Authorization form (LCA form). This is a set in quintuplicate and the authorized dealer will issue LCA form to the individual importer at their request. After filled up and signed up the appropriate column of the LCA form, the importer will submit it to Authorized Dealer who intern forward the same to Bangladesh Bank for registration where fund is purchased from Bangladesh Bank. After registration Bangladesh Bank forward the 1st and 2nd copy of LCA form to the Authorized Dealer, 3rd and 4th copy to CCI & E and keep the 5th copy as their office copy. 1st copy of LCA is known as Exchange Control copy against which Authorized Dealer can open L/C at the request of the importer. 2nd Copy is known as custom purpose copy which will be handed over to the importer who will clear the goods from the port on its arrival through this custom purpose copy of LCA along with other shipping documents. 4) IMP form one set duly signed by the importer. The specific courses of action that consumers pursue and their special goals are selected on the basis of their thinking processes (i.e., cognition) and previous learning. For that reason, marketers who understand motivational theory attempt to influence the consumer’s cognitive processes. Various groups provide specific challenges in terms of motivation. In this section we want to focus on how to apply motivation concepts in this chapter, which is the related with organizational growth. In contrast to a generation ago, the typical employee today is more likely to be a highly trained professional with a college degree than a blue-collar factory worker. These professionals receive a great deal of intrinsic satisfaction from their work. They tend to be well paid. So what, if any, special concerns should you be aware of when trying to motivate a team of engineers at Intel, a software designer at Microsoft, or a group of CPAs at Waterhouse? Professionals are typically different from nonprofessionals. They have a strong and long- term commitment to their field of expertise. Their loyalty is more often to their profession than to their employer. To keep current in their field, they need to regularly update their knowledge, and their commitment to their profession means they rarely define their work week in terms of 8 to 5 and five days a week. What motivates professionals? Money and promotions typically are low on their priority list. Why? They tend to be ranked high. They like to tackle problems and find solutions. Their chief reward in their job is the work itself. Professionals also value support. They want others to think what they’re working on its important. Although this may be true for all employees, because professionals tend to be more focused on their work as their central life interest, nonprofessionals typically have other interests outside of work that can compensate for needs not met on the job. The foregoing description implies a few guidelines to keep in mind if you’re trying to motivate professionals. Provide them with ongoing challenging projects. Give them autonomy to follow their interests and allow them to structure their work in ways that they find productive. Reward them with educational opportunities – training, workshop, attending conferences – that allow them to keep current in their field. Also reward them with recognition, and ask questions and engage in other actions that demonstrate to them you’re sincerely interested in what they’re doing. An increasing number of companies are creating alternative career paths for their professional / technical people, allowing employee to earn more money and status, without assuming managerial responsibilities. At Merck & Co. IBM, and AT&T, the best scientists, and researchers gain titles such as fellow and senior scientist. Their pay and prestige are comparable to those of managers but without the corresponding authority or responsibility. We noted that one of the more comprehensive changes taking place in or organizations is the addition of temporary or contingent employees As downsizing has eliminated of “permanent” jobs, an increasing number of new openings are for part-time, contract, and other forms of temporary workers. For instance, in 1995, approximately 6 million Americans, or the contingent workforce. These contingent employees don’t have the security or stability that permanent employees have. As such, they don’t identify with the organization or display the commitment that other employees do. Temporary workers also are typically provided with little or no health care, pensions, or similar benefits. There is no simple solution for motivating temporary employees. For that small set of temps who prefer the freedom of their temporary status – some students, working mothers, seniors – the lack of stability may not be an issue. Additionally, temporariness might be preferred by those highly compensated doctors, engineers, accountants, and financial planners who don’t want the demands of a stable job. But these are the exceptions. For the most part, temporary employees are so involuntarily. What will motivate involuntarily temporary employees? An obvious answer is the opportunity for permanent status. In those cases where permanent employees are selected from the pool of temporaries, temporaries will often work hard in hopes of becoming permanent. A less obvious answer is the opportunity for training. The ability of a temporary employee to find a new job is largely dependent on his or her skills. If the employee sees that the job he or she is doing for you can help develop salable skills, then motivation is increased. From an equity standpoint, you should also consider the repercussions of mixing permanent and temporary workers where pay differentials are significant. When temps work alongside permanent employees who earn more, and get benefits too, for doing the same job, the performance of temps is likely to suffer. Separating such employees or converting all employees to a variable-pay or skill-based pay plan might help lessen this problem. Not everyone is motivated by money. Not everyone wants a challenging job. The needs of women, singles, immigrants, the physically disabled, senior citizens, and others from diverse groups are not the same as a white American male with three dependents. A couple of examples can make this point clearer. Employees who are attending college typically place a high value on flexible work schedules. Such individuals may be attracted to organizations that offer flexible work hours, job sharing, or temporary assignments. A father may prefer to work the midnight to 8 A.M. shift in order to spend time with his children during the day when his wife is at work. If you’re going to maximize your employees’ motivation, you’ve got to understand and respond to this diversity. How? The key word to guide you should be flexibility. Be ready to design work schedules, compensation plans, benefits, physical work settings, and the like to reflect your employees’ varied needs. This might include offering child and elder care, flexible work hours, and job sharing for employees with family responsibilities. It also might include offering flexible leave policies for immigrants who want occasionally to make extensive return trips to their homelands, or creating work teams for employees who come from countries with a string collectivist orientation, or allowing employees who are going to school to vary their work schedules from semester to semester. One of the most challenging motivation problems in industries such as retailing and fast food is: How do you motivate individuals who are making very low wages and who have little opportunity to significantly increase their pay in either their current jobs or through promotions ? These jobs are typically skilled with people who have limited education and skills, and pay levels are little above minimum wage. Traditional approaches for motivating these people have focused on providing more flexible work schedules and filling these jobs with teenagers and retirees whose financial needs are less. This has met with less than enthusiastic results. For instance, turnover rates of 200 percent or more are not uncommon for businesses like McDonald’s. Taco Bell, PepsiCo’s Mexican fast-food chain, has tried to make some of its service jobs more interesting and challenging but with limited results. It has experimented with incentive pay and stock options for cashiers and cooks. These employees also have been given broader responsibility for inventory, scheduling, and hiring. But over a four year period, this experiment has only reduced annual turnover from 223 percent to 160 percent. What choices are left? Unless pay and benefits are significantly increased, high turnover probably has to be expected in these jobs. This can be somewhat offset by widening the recruiting net, making these jobs more appealing, and raising pay levels. You might also try some nontraditional approaches as well. To illustrate, Judy Wicks has found that celebrating employees outside interests has dramatically cut turnover among waiters at her White Dog Cafe in Philadelphia. For instance, to help create a close and family-like work climate, Wicks sets aside one night a year where employees exhibit their art, read their poetry, explain their volunteer work, and introduce their new babies. Our final category considers employees who do standardized and repetitive jobs. For instance, working on an assembly line or transcribing court reports are jobs that workers often find boring and even stressful. Motivating individuals in these jobs can be made easier through careful selection. People vary in their tolerance for ambiguity. Many individuals prefer jobs that have a minimal amount of discretion and variety. Such individuals are obviously a better match to standardized jobs than individuals with strong needs for growth and autonomy. Standardized jobs should also be the first considered for automation. Challenging and interesting or to being redesigned. Some tasks, for instance, are just far more efficiently done on assembly lines than in teams. This leaves limited options. You may not be able to do much more than try to make a bad situation tolerable by creating a pleasant work climate. This might include providing clean and attractive work surroundings these breaks, and empathetic supervisors. NCC Bank Ltd. has committed to Boost up the export position and diminishes the import position, rising of Gross Domestic Product (GDP) maximizing the national growth & abolishing the unemployment percent of an educated sector of the nation. All the brunches of National Credit And Commerce Bank Limited are authorized dealer of Foreign Exchange Business. The authorized dealer motivates the importer to import Raw materials, Fabrics, Accessories, Chemicals, Vegetable Fat etc. The import or export is motivated by the NCC Bank Limited to the foreign exchange business, particularly to open the letter of credit. A letter of credit offer advantages both to the importer and exporter. The advantages accruing to either of the parties differ depending upon the nature of credit opened their Certain Common benefit accruing from the use of credit as under. i) Ability: The letter of credit enables the importer of purchase materials (particularly in sellers market) without making full advance payment. ii) Assurance: If the importer task certain safe guards, like calling for packing list, invoice etc, the quality and quantity of the goods consigned is assured. iii) Without Payment: Prided the buyer has buying credit with the NCC Bank he may get goods released by the Bank under trust (ex.’s. LTR, LIM etc), i.e. without payment and pay for then on sale. i) Undertaking: A superior undertaking of the bank under the letter of credit assures the importer that when the documents are tendered as per the turns of the credit payment would be made to him. ii) Controlling: The exporter is absolved of the botheration of knowing in details the exchange control regulations of the importer country and is also increased to some extent against charges in such regulations. At first, an importer will request banker to open L/C along with the following documents. Indent or Proforma invoice is the sale contract between seller and buyer in import-export business. There is slight difference between indent and Proforma invoice. The sales contract, which is direct correspondence between importer and exporter, is called Proforma invoice. There is no intermediary between them. On the other hand, there may be an agent of exporter in importer’s country. In this regard, if the sale contract is occurred between the agent of exporter and importer then it is called indent. Whether the goods to be imported are permissible or not. Whether the goods to be imported are demandable or not. • Import Mercendised Permit Form (IMP). • L/C Application Form (L/CAF). • L/C Authorization Form (L/CAF). Bank’s officer prepares L/C when above mentioned forms are to be submitted by customer or importer. Before preparing L/C SIBL officer scrutinizes the application in the following manner. Survey reports or certificate in case of old machinery is required. Bank of the importer is called ‘L/C Issuing Bank’. Then issuing bank inform it’s corresponding bank, called “Advising Bank’ or ‘Confirming Bank” located in exporter’s country to advice and the credit forward to the exporter and simultaneously officer makes L/C opening vouchers. One debit voucher to be passed. Corresponding credit voucher to be passed (Margin, commission, postage, stamp, F.F.C. and others). Liability voucher to be passed. L/C Applicants A/C or Customer’s A/C Dr.
F.FC. (foreign corresponding charge) A/C Cr. The amount of Commission on Letter of Credit handled by the Bank in 2002, 2003, 2004 were nearly same. But later on 2005 was increased huge amount from 2004, rate of growth being 13.53%. 2005 and 2006 is nearly same. The chart below shows the growth of Commission on Letter of Credit for last 05 years. The amount of Commission on Payment against document handled by the Bank in 2002 and 2003 was nearly same. But after 2003, this has decreased huge amount and 2004, 2005 and 2006 is nearly same. The difference between 2003 and 2004 is-55.74%. The chart below shows the growth of Commission on Payment against document for last 05 years. The amount of Additional Confirmation Commission on Letter of Credit handled by the Bank in 2002 and 2003 was nearly same but in 2004, this amount was increased huge amount. Later on 2005, this amount was decreased huge amount and the difference between 2004 and 2005 was -55.96%. But 2005 and 2006 is nearly same. The chart below shows the growth of Additional Confirmation Commission on Letter of Credit for last 05 years. The amount of Commission on Back to Back L/C handled by the Bank in 2002, 2003, 2004 was nearly same. But later on 2005 and 2006 was nearly increased. The difference between 2005 and 2006 was 51.04%. The chart below shows the growth of Commission on Back to Back L/C for last 05 years. Now we shall discuss the strengths, Weakness, Opportunities and Threats in the following paragraphs. The banking service is easily accessible and feasible. Banks are the only media through which international trade and commerce emanate and entire credit transaction, both national and industry. The authorized capital of the bank stood at Tk.2500.00m in 2005. Paid up capital of the bank is tk 975.04 m in2005. The Reserve fund of the bank increased to tk 562.74 m in 2005 as against tk 425.22 m of previous year, increase being 32.34%. Deposit of the bank at the end of the year 2005 was tk 21478.22 m registering an increase of 33.66% over previous year’s figure. The advances growth of the Bank in increasing rapidly. The bank is a member of ATM network along with other Banks which enabled the bank to extend modem banking facility to the customer. The bank has been pleased to recommend 10% cash and 10% Bonus share for the shareholder. The bank has already obtained principal membership of MasterCard and VISA credit card. Lack of ‑promotional objectives and strategies. Number of branch is. Lower then other competitor. Absence of attractive remuneration package and motivation for the employees. In developing countries like Bangladesh banking sector would be the only sources of financing. They can diversify their portfolio by introducing new sectors like Leasing, Introducing ATM machines of there own, one point service, Tele banking, Debit card, etc. The banking sector of Bangladesh is growing very fast. The banking can also start micro‑credit business for individuals and small business like Grameen Bank. Going for Islamic banking system, as Bangladesh a Muslim nation. The most of the threats for the company are coming from the competitors. Bank has a chance to lose its market share to the competitors if it does not take necessary actions. Opening of the recently permitted new banks, without implementation of the needed reforms, could lead to unethical competition and house trading in the country’s troubled banking sector. The size of the market and the present state of economic activity did not provide adequate scope for business for a large number of banks with poor management and backdated operating system. The customer service of the Bank is not too good like other banks. In the Foreign Banks, there are customer service department. But in this bank there is no Customer service department. Online Banks are providing more threats on the banks which are not yet on lined like this bank. To attract more clients, NCCBL has to create a new marketing strategy, Which will increase the total export Import business. Effective and efficient initiatives are necessary to recover the default loans. Attractive incentive package for the exporter will help to increase the Export and accordingly it will diminish the balance of payment gap of NCCBL. To decrease margin rate for all clients. This is very risk for the Bank but if the Bank wants to target many clients, this is very important. Different types of training very much required for the bank officials. Computerized banking system and latest communication device are the most important elements for this century. So, for the sound and stable Banking operation, NCCBL has no alternative but the modernization. Foreign exchange operations of other banks are more dynamic and less time consuming. NCCBL should take some initiative to compete with those Banks. To decrease commission and other charge from other banks. Bank can provide foreign market report, which will enable the exporter to evaluate the demand for their products in foreign countries. The Bank must be to introduce On Line Banking between all branch. Number of branches is very limited of this Bank. They have to increase the number of branches at various key points of the country. National Credit and Commerce Bank Limited (NCCBL) playing a vital role in financing import and exports of the country. Without Bank’s co-operation, it is not possible to run any business or production activity in this age. Exports and import need finance in various stages of their activities. Export and import financing are letter of credit (L/C), payment against documents (PAD), loan against imported merchandise (LIM) etc. All these facilities are provided by NCCBL. For this purpose Bank’s consider the borrower’s business standing, integrity, liability with the bank term and conditions of the L/C. There is lot of risks involved in foreign business. So, the National Credit ant commerce Bank Limited (NCCBL) has to clearly justify the customers from a neutral point and gather the current information about the market.